Watching last Sunday’s Eagles-Redskins game was nostalgic if only for the fact that it seemed like the days of Buddy Ryan had returned. Boisterous Buddy on one sideline with Joe Gibbs on another. Randall Cunningham at quarterback for the Eagles with Mark Rypien at the helm for the ‘Skins. A close, down to the wire game with two teams who’s disdain for each other was not hidden. And a fight near the end just to add to all the drama. While there was no Andre Waters playing safety for the Eagles, all of the injuries made this game eerily similar to the famous Monday night “bodybag” game in which the Eagles knocked out three Washington quarterbacks, until finally, ‘Skins running back Brian Mitchell came in as the emergency 4th string quarterback and led Washington to a touchdown in garbage time. Adding intrigue to a classic game was the cheapshot that Nick Foles received from Redskins defensive end Chris Baker that wouldn’t have been considered a cheapshot back in the day, but is in today’s “save the quarterback” NFL. The irony is that former Eagles defensive lineman Hugh Douglas did the same exact thing to Bears quarterback Jim Miller in a 2001 divisional playoff game in Chicago, resulting in a road playoff win for the Birds and their first NFC championship appearance in 21 years. Another strange twist after yet another Eagles comeback win was cornerback Cary Williams complaining that the Eagles tiring practices have been resulting in weary Eagles players during the tail end of games, which seems strange when the team seems to look stronger than their opponent in the 4th quarter ever since Chip brought his psedu/new age training techniques to the City of Brotherly Love. Cary Williams is an intriguing figure in that he can “talk the talk” like Seattle Seahawks cornerback Richard Sherman. The bad news for the Eagles is that more often, he plays cornerback like fitness guru Richard Simmons – a lot of bouncing around but very little contact, which worked well for DeSean Jackson on Sunday as he flew past Cary for a 81-yard touchdown to tie the game and then performed his own “gyrations” in the endzone. Williams once again apologized for his remarks (just as he did for calling the Patriots cheaters in the preseason) but one suspects he may be apologizing for another team come 2015. But right now, he’s unfortunately the best thing we got folks. This week, the Eagles jet off to the Bay Area to face the San Francisco 49ers in what should be dubbed the “Amoroso vs. Sourdough bowl”, even though it’s played in a stadium named after jeans (don’t ask). The last two consecutive weeks, I picked the Birds to lose and they won both times (don’t be hatin’). And the Niners, three games in, are on the verge of season extinction and a loss would have the locals crying in their Sierra Nevada Pale Ale or their Napa wines (based on your adult beverage preference). The Eagles also come into this game dangerously thin on the offensive line, which doesn’t bode well for LeSean McCoy’s rushing stats or his ego. But even though all signs point to a Niners victory, there is something uncanny about this Eagles team….something different. It’s as if Chip has them moving at another level, with no one able to stop them. The Niners play to stop the run and the Birds take advantage through the air, winning 38-30 in a competitive game till the end. To celebrate afterwards, Chip treats them to an “In-N-Out” burger at Fisherman’s Wharf before the charter flight home. For a while, it looked like Broad & Pattison would turn upside down. 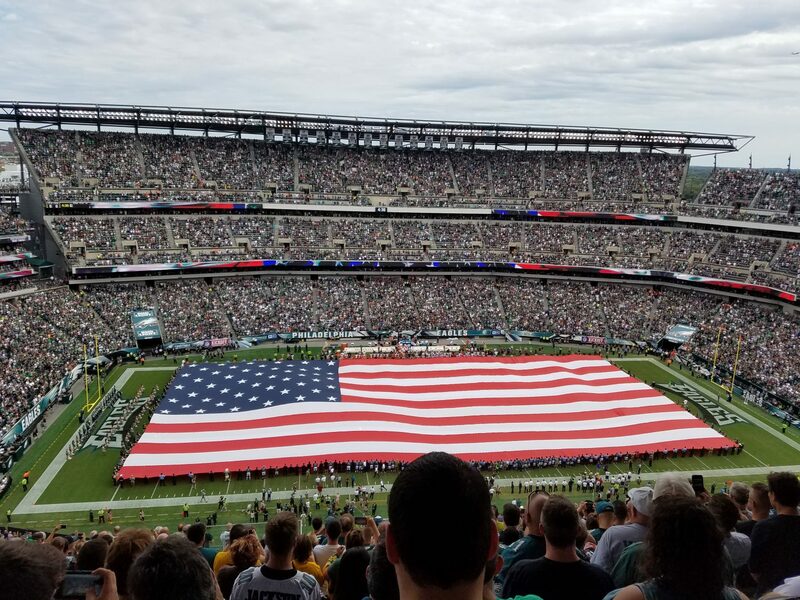 For the first thirty minutes of the Eagles season opener, in a season of high expectations, the Birds looked flat, confused, and disoriented, and the Jaguars capitalized, turning three turnovers into a 17-0 halftime lead. Things looked so bleak that even the poor dogs who were performing tricks as the halftime entertainment were subject to the fans ire whenever they failed to catch a frisbee in their mouth, being greeted by the signature “BOOOOOOO…” that we are so famous for. But one play in football can quickly change a team’s fortunes. Early in the 3rd quarter, with the Eagles failing on a 3rd and short opportunity and facing a 4th & 1, Chip Kelly had already instructed his team to go for it even before the fans started pleading the team to do so. It was now Jacksonville who looked lost and confused, and without the proper defensive alignment, it seemed as if the seas had parted as newly acquired running back Darren Sproles took the handoff and galloped into the end zone without much resistance, cutting the Jaguars lead to 17-7 and kickstarting the Eagles 34 unanswered points en route to a 34-17 victory. Another bright spot during the afternoon was that rookie kicker Cody Parkey kicked another 50+ yard field goal, which must have given coach Chip Kelly some comfort that he made the right decision in cutting Alex Henery. It probably also means that Cody can extend what is most likely a “month-to-month” apartment lease for another month. What to make of the Birds after one game? If an Eagles fan had managed to see the final score without viewing the game, he/she would of thought it was along the lines of what was expected. But it was how the Eagles got to the final result that is a little unnerving. Nick Foles made too many mistakes in the 1st half, often dancing around the pocket as if he was taking salsa lessons for the first time and realized that he had two left feet (Good ole Nick doesn’t look like the type who will be seen competing on “Dancing with the Stars” anytime soon, but that’s perfectly fine with me). And while Foles did play much better in the 2nd half, many of his passes seemed to consist of checkdowns to the running back, with the wide receivers being almost nonexistent. Perhaps that’s what the defense was giving him…or perhaps the loss of DeSean Jackson was more important than we thought. Either way, when the Birds face the Colts this Monday night, getting off to a start like they had against Jacksonville would certainly doom them for the remainder of the game. The Colts are not in rebuilding mode like Jacksonville is, and will be playing with a sense of urgency as a loss Monday night would make them 0-2 on the young season. The Eagles would do well to get off to a good start to have any chance of winning the game, but will be playing with two fill-ins on the offensive line. The Colts will be without their star defensive linebacker Robert Mathis, which should help the Birds passing game. Knocking another stadium off of the bucket list as I head to Indy for the game on “Mondayyyyy Night Football” (as Al Michaels used to say before he started working for “Sundayyyyyy Night Football”). We have HIGH Hopes, we have HIGH Hopes, we have, eye in the sky, apple pie hopes…. Unlike the Phillies, who’ve been, and will continue to be, in rebuilding mode for the next few years, the Eagles took a detour on that path and turned a 4-12 season just two years ago into a ten win NFC East championship in 2013. The start of football season in these parts always brings with it a sense of optimism and excitement, but that has been heightened considerably this year. Eagles coach Chip Kelly’s first training camp was viewed almost like a circus act. Most of us were curious to see what tricks he had up his sleeve, if only for the fact that he was considered a novelty, but an unproven novelty. This year, there is a sense that not only does Chip know what he is doing, but that he has his team on board as well, no easy feat when you consider that he is dealing with athletes who are getting paid to do a job and are no longer college students as was the case at his previous job in Oregon. On top of that, the NFC East is ripe for the taking just as it was in Andy Reid’s first few seasons at the helm in the early 2000’s. The Giants seem to be an older team on the path to mediocrity. The Cowboys needed to resort to signing Michael Sam just to get any publicity, since their season seems to be over before it even starts. And the Redskins? Can you say OVERRATED boys and girls? And that goes for their quarterback (RG3) as well. Look for Kirk Cousins to eventually take over that team. Not only did the Eagles quick turnaround last year raise the fans hopes, but the sad truth is that they are the only game in town. The Phillies treat their older veteran players as if they were professors with “tenure”, refusing to acknowledge even the thought that perhaps starting over with young and fresh blood is the best strategy. And while some of the bad decisions fall at the feet of Phils GM Ruben Amaro, firing Amaro would be nothing more than a band-aid approach when cutting off the head of the dragon is really what is needed. Phillies president David Montgomery, while a decent businessman and a model human being, seems to refuse to believe that he has a lousy scouting department, lousy farm system, etc., always implying that he’s happy with the people he has in place. If Montgomery was the captain of the Titanic, he would probably tell you that the ship’s not sinking when half of it was already submerged under water. Across the street, Flyers chairman Ed Snider, growing impatient with his team’s lack of a Stanley Cup since the 1970’s, has allowed his front office to sign players who, while not as “over the hill” as the Phillies current core, were a year away from being past their prime (can you say Vinny Lecavalier anyone?). This misguided strategy has resulted in one too many first and second round playoff exits, and while the arrival of new general manager (and former Flyers goalie) Ron Hextall should change that, the rebuilding process could still take a few years. While the Flyers Wells Fargo counterparts, the Sixers, aren’t looking to get older, they seem to be looking strictly for young and INJURED players, with the hope that one day all of them will exit the infirmary at the same time and start playing basketball together as if they were the second coming of Kobe Bryant and Shaquille O’Neal. This strategy is sadly, exactly what is required in a screwed-up NBA, and it unfortunately took the Sixers too long to figure this out, so now they, just like the Phillies, are light years away from contention. Look for these two clubs to start contending just around the time that the first Walmart or McDonalds opens on Mars. Alex Henery, during his three years as the placekicker, became the “Bobby Abreu” of the Eagles – he had great stats, but never seemed to deliver in the clutch. But with so few experienced kickers out there, his job seemed relatively safe until rookie Cody Parkey, who’s name sounds more like he’s the main character in an upcoming FOX show about the wild west, kicked two field goals from 50+ yards in the final preseason game, prompting the Eagles to send Henery out the door with a case of Tastykakes as a parting gift. Somewhere in the back of my mind, I have this uneasy feeling that at some point in January/February 2015, the Eagles hopes of ending their 54-year-old championship drought will rest on Parkey’s right leg. That could end up being his “Matt Stairs” moment…or his Scott Norwood/Bill Buckner moment, depending on the outcome. So what happens this Sunday against Jacksonville? This could be the first time in years where I’m leaving a game midway through the 4th quarter since the outcome is no longer in doubt. The first time in years where I get to Broad & Pattison and the express trains haven’t started running since the game is still not officially over. The first time in years where I get to my car in center city and the coach’s postgame news conference hasn’t even started yet. Congrats to the Taney Dragons for a successful season. While they did not win the Little League World Series, the fact that they made it to the tournament and went as far as they did is a testament in itself. Even more impressive is the fact that they are actually from Philadelphia. Not Bucks or Montgomery County, not Voorhees, Cherry Hill, or Moorestown, NJ but PHILADELPHIA. The team as a whole seems quite humble, and their star pitcher, Mone Davis, displays the maturity of one who is a veteran MLB pitcher and not a thirteen year old.